Many filmmakers often go back to basics in the wake of disappointment or failure– it’s a way to reconnect with our roots and recommit to the convictions that led us to pursue a career in film in the first place. In other words, it’s a renewal of vows after being led astray by indifference, indulgence, or complacency. More often than not, these downscaled efforts reinvigorate their filmmaker’s careers and allow them to better realize their vision in larger subsequent works. This strategy worked wonders for director Wes Anderson, who came back from a protracted slump with his lo-fi masterpiece MOONRISE KINGDOM (2012). Anderson has always had a consistently identifiable and original filmmaking style– a style that has blossomed and evolved as the second act of his career unfolds. Anderson’s creative renaissance translated to the commercial and critical success of MOONRISE KINGDOM, which he was then able to parlay into his grandest caper yet– a sprawling, confectionary portrait of a bygone gilded age called THE GRAND BUDAPEST HOTEL (2014). 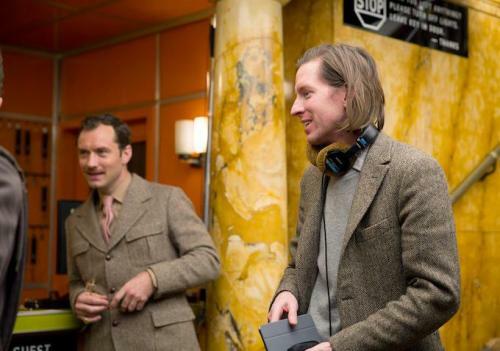 Whereas his previous features were written with a co-writer (usually Owen Wilson, Noah Baumbach, or Roman Coppola), Anderson alone sculpted his screenplay for THE GRAND BUDAPEST HOTEL, drawing inspiration from a story co-written by Hugo Guinness and the writings of author Stefan Zweig. Assumedly, it probably didn’t take long for Anderson’s regular producing partners Scott Rudin, Jeremy Dawson and Steven Rales to hop on board the good ship American Empirical for another promising adventure of international intrigue and heroic derring-do. For whatever troubles Anderson and his team encountered in mounting the picture, their faith was rewarded when THE GRAND BUDAPEST HOTEL was anointed as the biggest artistic and commercial success of the filmmaker’s career. THE GRAND BUDAPEST HOTEL takes place in the fictional country of Zubrowka, vaguely located somewhere in the mountains of central Europe. A small town in Germany played the part, with the production converting an abandoned, derelict department store into the gilded, soaring lobby and hallways of the titular hotel. Anderson’s epic caper unfolds across several distinct time periods within the 20th century, each nestled inside of the other like a cinematic Russian nesting doll. As is to be expected in a film about luxury and indulgence, THE GRAND BUDAPEST HOTEL boasts no less than three narrative framing devices. We begin in present day, where a young girl has made a pilgrimage to a sleepy, wintry cemetery while clutching a hardcover copy of a novel titled “The Grand Budapest Hotel”. She finds the memorial belonging to the book’s author (unnamed in the film) and sits down to read under the watchful eye of the statue commissioned in his likeness. We then flash back to 1985, where the Author (Tom Wilkinson) is filming himself as he sets up some of the political and social context surrounding the main story. This triggers another flashback to the year 1965, where we finally see the Grand Budapest Hotel, but as it was shortly before its demolition: a dilapidated, neglected ruin with hideous midcentury decor. The Author (now played by Jude Law) is a guest at the hotel… maybe the only guest. While hanging around the lobby, he becomes fascinated by the quiet presence of the hotel’s distinguished, elderly owner– allegedly the richest man in Zubrowka, Mr. Moustafa (F. Murray Abraham). A chance encounter in the hotel’s spa leads to a dinner invitation, where Mr. Moustafa regales the Author with how he came to own the property. This prompts yet another flashback to 1932, the time in which the film’s main narrative is set. The Grand Budapest Hotel is living out its opulent heyday, a golden age brought about in part by the impeccable leadership of the hotel’s concierge, M. Gustave (Ralph Fiennes). Considered one of the best concierges in the field, he takes a young man named Zero (Tony Revolori) under his wing as his apprentice, helping him to ensure the orderliness of the hotel while he romances the many wealthy, elderly female guests. When one of his favorites, Tilda Swinton’s Madame D, abruptly dies from suspected poisoning by an unknown agent, Gustave is bequeathed one of her most prized possessions– an invaluable masterpiece of Renaissance art titled “Boy With Apple”. Gustave and Zero are thrust into the middle of the competing factions seeking Madame D’s fortune, and it’s not long before our heroes are conveniently framed for her murder. After breaking out of prison, Gustave and Zero hatch a scheme to clear their names and take back the leadership of their beloved hotel, even as the encroaching shadow of a second world war threatens to change their way of life forever. Anderson’s films are remarkably notorious for procuring well-known, well-respected actors and coaxing them into showing audiences a side of themselves they’ve never shown before. THE GRAND BUDAPEST HOTEL carries on this tradition in grand fashion, boasting what is easily the largest cast ever assembled for an Anderson film. His ensemble is comprised of many faces both old and new, and can be divided into several groups pertaining to their respective time periods. The fact that he was able to gather so many marquee names under one roof (even for the bit parts) is a testament to the substantial respect and affection that Anderson has been able to garner for both himself and his idiosyncratic vision. 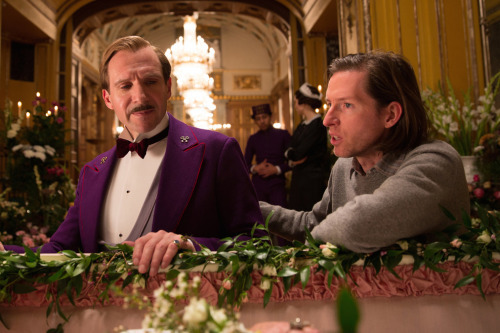 The 1932 storyline claims the lion’s share of Anderson’s cast, headlined by Ralph Fiennes’ deliriously entertaining performance as M. Gustave, the mannered and elegant concierge of the Grand Budapest. He’s the personification of Victorian-era ideals regarding civilized manner and discretion, but Fiennes subverts his own stuffy image with a rascal’s womanizing streak. Fresh-faced Tony Revolori makes his film debut as Zero, the wide-eyed lobby boy and anxious apprentice to Gustave. Like many of Anderson’s prepubescent heroes, Zero is an orphan, having been deprived of parents at an early age when soldiers raided his hometown. MOONRISE KINGDOM’s Tilda Swinton is almost unrecognizable under heavy makeup as Gustave’s wealthy and decrepitly elderly paramour, Madame D. THE DARJEELING LIMITED’s Adrien Brody delivers a deliciously vindictive brand of old-school, black-suited villainry as Madame D’s son, Dmitri. The film serves as something of a mini reunion for THE LIFE AQUATIC WITH STEVE ZISSOU’s Willem Dafoe and Jeff Goldblum, who play Jopling and Deputy Kovacs, respectively. Jopling is a skeletal, murderous brute under Dmitir’s employ, while Kovacs’ occupation as an attorney requires him to string along an avalanche of complex multi-syllabic words (which, of course, the verbosely eloquent Goldblum delivers effortlessly). A host of other inspired casting choices rounds out the 1932 storyline’s supporting cast. Edward Norton, who previously appeared in Anderson’s MOONRISE KINGDOM, plays an altogether different kind of antagonist from Madame D’s brood– the distinguished, gentlemanly military officer Henckels, whose pursuit of Gustave is complicated by his own personal fondness for the man. Previous Bond villain Mathieu Almaric plays Serge X, the scheming servant for Madame D, while future Bond girl Lea Seydoux plays Madame D’s French maid, Clotilde. Irish actress Saoirse Ronan is a natural fit as Zero’s love interest Agatha, a sweet-natured baker with a birthmark on her face in the shape of Mexico. Veteran tough-guy actor Harvey Keitel turns in his second consecutive performance under Anderson’s direction as Ludwig– a bald inmate covered in tattoos who helps Gustave break out of jail. One of the film’s more inspired details is Gustave’s membership in a secretive cabal called The Society of the Crossed Keys, comprised of other in-the-know, overachieving hotel concierges just like him. While the appearances of these other concierges are fleeting, Anderson populates their ranks with some of his most-trusted stock players– Bob Balaban (who played the Narrator in MOONRISE KINGDOM), Wallace Wolodarsky (the assistant with alopecia in THE DARJEELING LIMITED), and Waris Ahluwalia (the camera-man in THE LIFE AQUATIC WITH STEVE ZISSOU, among various parts in other works). The biggest of these concierge roles is reserved for Anderson stalwart Bill Murray, who’s comedic talents are criminally underused as the fabulously-mustached concierge M. Ivan. Finally, longtime collaborator Owen Wilson appears briefly as M. Chuck, the temporary concierge of the The Grand Budapest when it comes under the militaristic rule of the ZZ. The 1965 portion of the film has a very different vibe, which necessitates the casting of very different performers. Jason Schwartzman is the only familiar Anderson face here, playing the Grand Budapest’s slacker concierge, M. Jean. Schwartzman’s M. Jean is cavalier and aloof, always with a cigarette tucked between his lips. He’s the personification of the sweeping change in society brought about by WW2 and the ensuing decades. Gone are the gilded, stately parlors and the unfailing hospitality of their stewards– replaced with brutalistic, function-over-form remodels and snobby, self-interested skeleton crews. As Mr. Moustapha (the older version of Zero), F. Murray Abraham may not resemble his 1932 counterpart Tony Revolori, but it only serves to convey the chasms of distance between the boy he was then and the seasoned older man he’s become. Jude Law is bookish and attentive as the Young Writer, the conduit through which Anderson channels his framing device. Tom Wilkinson is convincing as Law’s character twenty years on, having grown more professorial and curmudgeonly as he’s aged. THE GRAND BUDAPEST HOTEL resembles something of a decadent pastry or confection– indeed, many critics have likened the film to a giant layer cake. What this means in the context of Anderson’s visual development of a filmmaker is that he’s returned to an aesthetic that favors the control of artifice, having previously ceded ground to the unpredictability of MOONRISE KINGDOM’s naturalistic approach. That’s not to suggest that Anderson has failed to innovate; in fact, the exact opposite is true. THE GRAND BUDAPEST HOTEL finds Anderson radically experimenting with his visual style. The most superliminal aspect of this is his inspired use of different aspect ratios to convey different time periods. To my knowledge, this has never been done before with a somewhat-mainstream Hollywood film. While Christopher Nolan might have tested the waters of switching aspect ratios mid-film by mixing 35mm and IMAX footage in his DARK KNIGHT TRILOGY, Anderson’s approach is groundbreaking in that it seems to be the first time that aspect ratio has been deployed as part of the storytelling tool itself. Each time period gets its own aspect ratio: the modern-day and 1985 scenes are presented in the standard 1.85:1 Academy ratio, whereas the 1965 scenes utilize Anderson’s signature 2.35:1 anamorphic frame. The bulk of the film– the 1932 storyline– is shot in the 1.37:1 square aspect ratio, harkening back to classic old films from the period. Anderson’s tendency to create relatively flat compositions doesn’t work quite as well in 1.37:1 as it does in the wider aspect ratios, so he compensates by instead creating compositions that emphasize depth along the Z axis. Longtime Anderson cinematographer Robert Yeoman once again lends his expert hand (and eye) to the proceedings, capturing the film’s candy-coated palette in brilliant swathes of purple, pink, peach, red, orange, and blue. Curiously, one scene set on a train towards the end of the 1930’s timeline is presented in black and white– a decision that’s never fully explained, but is perhaps meant to convey the end of an era while foreshadowing that particular scene’s bleak ending. Despite all of Anderson’s experimentation and innovation, fans of his classical style can rest easy: there’s no short supply of lateral dolly and crane-based camera movements, whip-pans, top-down hand inserts, rack zooms, and compositions that cram his ensemble into a singular setup. In bringing a fictional country and a bygone era back to life, Anderson’s regular production designer Adam Stockhausen certainly has his work cut out for him. He fills Anderson’s blank canvas with layer upon layer of opulent costumes, sets, props, and conspicuous miscellanea meant to give a tangible sense of history and vibrancy to the fictional culture of Zubrowka. There’s a timeless, central European feeling to every single scene, despite the various (yet distinct) time settings. A magical, miniaturist quality pervades THE GRAND BUDAPEST HOTEL, due in part to the usage of matte paintings and miniatures in long shots meant to convey the picturesque Zubrowkian mountaintops and countryside. These expressionistic landscapes often dwarf the silhouetted outlines of the characters, recalling both a similar technique Anderson employed in FANTASTIC MR. FOX (2009) and the climax of MOONRISE KINGDOM, as well as the inspirations from which it draws: silent film and Chinese shadow plays. Understandably, THE GRAND BUDAPEST HOTEL has a lot of story to tell, and thanks to an elegantly choppy and breathlessly-paced edit by Anderson company newcomer Barney Pilling, that story miraculously manages to cross the finish line in under two hours without ever feeling rushed or unnecessarily condensed. Part of that effect can be attributed to returning composer Alexandre Desplat’s whimsically jaunty score, which brews a mix of pianos, exotic strings, brass, woodwinds, organs, imperious marches, and even a male choir to create a lush, orchestral score full of European intrigue. And to show how dedicated he is to recreating an immersive sense of period, Anderson foregoes his tendency to include modern rock and pop needledrops entirely, save for a few Germanic folk songs where appropriate. The setting of Anderson’s various stories has followed a linear evolution from exaggerated versions of real places to entirely fictional locales that never existed to begin with. This evolution has enabled Anderson to establish truly insular sandboxes for his characters to play in. This means that from BOTTLE ROCKET (1996) onward, his work has gradually taken on a cartoonish artificiality. The stop-motion animated FANTASTIC MR. FOX is obviously an actual cartoon, but out of all his live-action works, THE GRAND BUDAPEST HOTEL is easily Anderson’s most fanciful and least realistic-looking film to date. This isn’t a bad thing– in an age where our mainstream Hollywood films are more CGI-animated than not, it’s refreshing to see obsolete technologies coming back to lend a handmade, organic touch. This theatricality is a consistent force in Anderson’s work, containing his characters and actions within the bounds of a proscenium-like frame like an elaborately-staged diorama. It also manifests in the eccentric sartorial style of his characters and their affectations for uniform. Several other thematic fascinations have grown more pronounced as Anderson has developed, like the international, mostly-European flavor that has been steadily overtaking the tone of his work (and Anderson himself) and has reached its logical saturation point here. The depths of his characters’ melancholy has also increased in proportion to his films’ rising stakes. In THE GRAND BUDAPEST HOTEL, nothing less than world peace is on the line when a fictionalized version of World War 2 descends on the sleepy burg of Zubrowka. Don’t let the candy coating fool you– this film has quite the nasty streak when it comes to the malicious actions of its characters. Fingers are severed, guards are stabbed, lawyers are murdered, cats are heaved out of windows, firefights erupt in tranquil atriums, and the ideological conflicts of war make refugees and orphans out of unsuspecting Zubrowkians like Zero. Anderson counterbalances this with a gentler kind of melancholy, personified in the hotel itself– a bittersweet nostalgia over the glory days of old, and the aching regret we feel over our ultimate powerlessness against the ravages of time. Given a long enough time period, even our most stalwart and gilded monuments to our leisure class overlords will crumble away into neglect and ruin. Despite Anderson’s changing ideals and maturation as an artist, his boyish eagerness for a rollicking caper has been an unflagging, defining characteristic of his work. His adherence to this integral part of his identity has served him well in his career, no more so than with the release of THE GRAND BUDAPEST HOTEL. A Silver Bear win in Berlin was the opening salvo of a take-no-prisoners awards campaign that resulted in a tie with Alejandro Gonzalez Inarittu’s BIRDMAN: OR (THE UNEXPECTED VIRTUE OF IGNORANCE) for the most nominations at the 2015 Academy Awards. Anderson’s films had been nominated for Oscars before, but THE GRAND BUDAPEST HOTEL would be the first to actually win, taking home the coveted gold statue for its production design, makeup, original score, and costumes. For Anderson personally, Oscar nominations for Best Picture and Best Director would set a new high watermark in his artistic growth and enshrine a gold capstone atop his career’s second act. In a way, THE GRAND BUDAPEST HOTEL is somewhat akin to the “ultimate” Wes Anderson film (and not just because it’s the most critically and commercially successful film he’s ever made) – the epic stakes, the masterful control of style and tone, and the veritable rogue’s gallery of recurring Anderson-ian cast members all add up to one of the most thoroughly enjoyable and fulfilling works from one the medium’s most inimitably original voices. THE GRAND BUDAPEST HOTEL is currently available on high definition Blu Ray via Twentieth Century Fox.